In 1907, Allan Newton Barbour and his brother Charles came to Squamish and logged using 6 yoke of oxen and took out six 24' logs a "turn" (load). The area logged was near the PGE Shops (by Castle's Crossing), across the river rom the shops, on the Burnt Ground near the cemetery, at Paradise Valley, and about five miles north of Cheekye. 2 to 20 men were employed. It was customary to log close to the river so the logs just had to be dragged into the river and floated to the Howe Sound where they were picked up by the Powell River company tugs and taken up to their mills. Log jams were broken up by men in canoes. Mr McComb was the first to tow logs down the river in a boat. The Barbours would later sell out to Mr Yapp. Mr Yapp's Squamish Timber Company was incorporated on March 21, 1907. In 1910, the Yapp Company cleared the Cheekye area. A steam donkey would haul the logs 400 feet and then an 8 horse team hauled them 1/2 mile on a skid road. Another donkey, called a roader, took the logs to the river. Here the logs followed a log trough. Instead of chokers, logging dogs were used. 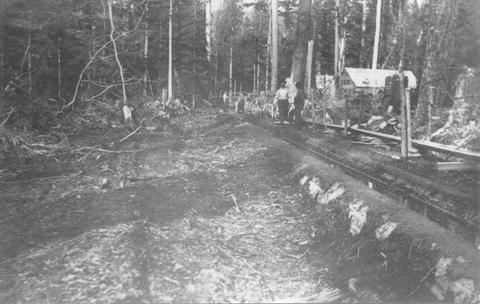 When the Howe Sound Northern Railway came into Cheakamus, the Yapp company used the train to transport logs to the booming grounds at Squamish. In 1911, a company owned by Mr Lamb took over the Yapp stand of timber. Research compiled by Eric Andersen, 2011: This photo, apparently taken by one of the Magee brothers, shows the construction phase of the flume project. The occassion is a visit to the site by Hughie Mills' new bride Catherine, the former Mrs Allen Rae, in the Spring of 1910. In this photo, Hughie Mills appears to be giving his wife a tour of the project. Mills was a building contractor in the valley, and very likely worked on the flume construction. The location is at the west side of the Squamish Timber Company camp, just above the bank of the Brohm River, which is to the left from this scene. It is difficult to tell from the photograph whether the water for the flume is being led from the Brohm River (in the back and to the left of of the photo) or the Cheekye River (around to the right). Either is possible. The Squamish Timber Co. camp and the beginning of the flume lies between the Brohm River and the Cheekye River. Water for the flume might be more easily taken from the Brohm( closer), but the Cheekye has the steeper gradient. The larger the logs to be flumed, and the steeper the grade, the more water is required.